The US Department of Defense is teaming with Apple, Boeing, Harvard University and other organizations to develop flexible electronics and sensors that could be placed in uniforms or inside ships and aircraft. Under the plan, a consortium called the Flexible Hybrid Electronic Institute will work on using 3D printing to build bendable, thin electronics that could match the contours of a person's body or a military vehicle, a defense department official told Reuters. The technology could find its way into soldiers' uniforms as health monitors or placed in the cramped compartments of a ship or aircraft to measure structural integrity, the official said. But the technology developed by the consortium, whose 162 members include Boeing, Harvard University and Hewlett-Packard, could also have civilian uses. For example, the sensors could be used to develop medical devices for the elderly. Under the plan, which will be managed by the U.S. Air Force Research Laboratory, the U.S. government will contribute $US75 million over five years while $US90 million will come from companies. Funding for the venture will total more $US171 million, with local governments contributing the remaining capital. 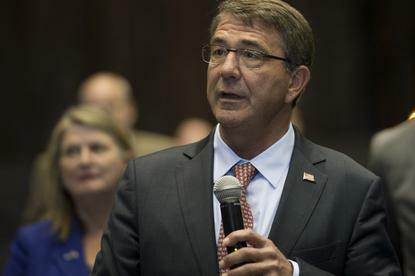 Defense Secretary Ash Carter will lay out details of the plan in a speech on Friday at Moffet Airfield near Mountain View, California, according to Reuters. In 2014, NASA, which operates the airfield, said it was leasing it to Google for 60 years. At the time, the search giant said it would use the space to research robots and other emerging technologies. Google's fleet of private jets also operates from the facility. More recently, Moffet Airfield was the site of a drone conference where Google outlined its plan for drone deliveries and the U.S. Navy showed off a custom drone it 3D-printed on its ships.